We had zero trick or treaters. This is a first for us. The houses are too far apart and set too far back from the street in our neighborhood. I think that if I were a kid, I would choose a different neighborhood, too. So, I've already eaten more than my share of these candy bars. I suggested to my daughters that we freeze half of them, to pull out some week when there aren't any goodies around. These would be good, chopped and added to scratch brownies. In addition, there's a Baby Ruth and apple salad recipe that looks interesting (Baby Ruths, whipped topping, and chopped apples -- that's it). How about your house? Did you get many trick or treaters? We got 15 this year. Never get a lot but the year I don't buy candy will be the year we get lots. We never get those deals on candy. That's my fear, too. But next year, I do think that I'll buy even less candy than this year. The candy I found on markdown in summer, and had it tucked away. It was a pretty great deal. We got one group but we had our lights turned off. We didn't answer the door because we were downstairs. We had a dryer issue to deal with. So it doesn't heat up anymore. I hate having issues to deal with. take two kitchen chairs and place them back to back, about 3 feet apart. Place a broom or mop across the top of the two chairs to create a hanging bar. Now hang your wet clothing on hangers, on this make-shift hanging bar. It's a great drying rack in a pinch, and it is made from ordinary stuff in the house, that goes back to being ordinary stuff when you're done. depending on the type of chair, you may be able to rest two mops/brooms, and double your hanging space. I have a double clothesline downstairs and 3 drying racks as well as a double clothesline outside. This is not a stressful situation for me since I don't mind drying clothes without the dryer. Hubby tried fixing it himself but that didn't work so tomorrow a repairman is coming. If he can't fix it then we'll look at purchasing another one. I can afford it since I am fairly good at saving. It will all work out! that was one positive-thinking and enthusiastic little boy, that one time! I plan on buying even less candy next year. Your granddaughters will be delighted that you didn't get any trick or treaters! 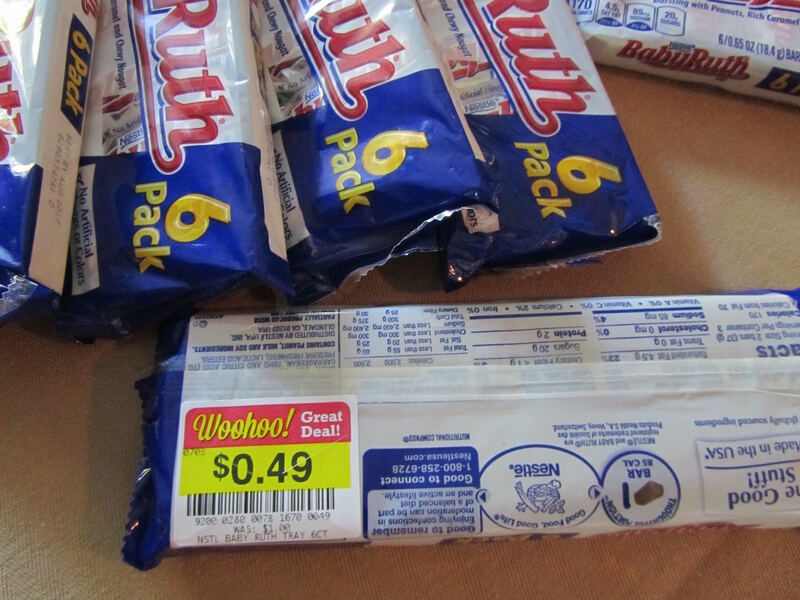 Yum, Baby Ruths! I think putting them in the freezer for another time is a great idea. Seems like we enjoy things more if we are able to save and spread them out. Not that we aren't appreciative of the things you must eat all at once...but I think it's an extra-special treat when you lay off for a little while, and then enjoy something again. We live in a place without streetlights, far from the road, so never get strangers coming for candy. This year we didn't even have our neighbors' kids coming, so I didn't even bake cookies for them (which is what we normally do for them. )I talked to a lot of my extended family just as the kids were coming out last night, so haven't heard if it was a busy or slow night elsewhere. Alice, good luck with the dryer! I sure feel your pain! We struggled with a dryer problem for a year, and then finally DH was able to fix it. It was SUCH a simple joy to have the clothes dry in one go, again, instead of THREE! No trick or treaters ever since we do not leave our electronic gate open and decorate the front area to signal that we are passing out candies. I don't like holidays either except for the terrific after holiday clearances. When the kids were young, of course, I made somewhat of a to do for them. Now, everyone just gets money on every occasion, so easy. That way, they can plan and budget their own wish lists. Less waste all the way around. However, this year since I have the crafting bug, I may add a handcrafted thing to give, along with money. Instead of buying a birthday card for my grandson's birthday this month, I bought a Star Wars coloring set on clearance at Wal-Mart for the price of a Hallmark card. I'm going to seal the paper box so it will last a long time (the box was so cute, I loved the box more than the contents), and slip the cash in an envelope inside the box. Boxes are more fun to open than cards anyway. I think we got around 20, but I was out with my daughter who was trick-or-treating, so I'm not sure. We are on a main road, so I don't think parents like their kids to be in a potentially dangerous (traffic-wise) situation. I was actually surprised at how many we got, as it was chilly. At least the rain and sleet stopped by the time trick-or-treating started! Your Baby Ruth salad sounds a lot like Snickers salad! Probably the same idea, different candy bar. This was a first year in our new house for Halloween, so I wasn't sure what to expect. We also have no street lights and the houses fairly far apart with some hills. I was surprised that we got about 30 kids. However, we had a block party before the trick-or-treating and there were a lot of little ones there. The block party was a nice neighborhood event and I got a chance to meet more people.